Background: Despite several advancements in antifungal drug discovery, fungal diseases like Invasive Candidiasis (IC) still remain associated with high rates of morbidity and mortality worldwide. Thus there is an enormous need for anti-Candida drugs. Objective: The main objectives of the work included: 1. To investigate therapeutically significant classes of secondary metabolites produced by S. chrestomyceticus strain ADP4. 2. To investigate and analyze inhibition of significant virulence attributes of C. albicans, such as, biofilm and secretory hydrolytic enzymes by ADP4 secondary metabolites. 3. Mechanistic analysis of probable compounds for their site of action on Secretary Aspartyl Proteinase 3 (Sap3). Methods: Metabolite extract-SDB (MESDB) of S. chrestomyceticus strain ADP4 was fractionated on silica gel column chromatography. Fractions were analyzed for anti-Candida activity by disc diffusion assay. Active fractions were further purified by differential solvent treatment. MIC90 values were determined by broth dilution method. MFC was based on counting viable cells. 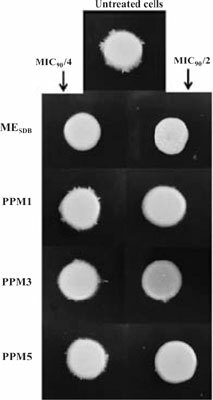 Inhibition of yeast to hyphae transition and that of production of hydrolytic enzymes were estimated by plate assays. GC-MS of MESDB and Partially Purified Metabolite preparations (PPMs) was done. GRIP docking studies with Sap 3 of C. albicans was done using VLife MDS 4.6 software. Results: Chemical profiling showed that ADP4 secondary metabolites contained alkaloids, flavonoids, polyphenols, terpenoids and triterpenes. The MESDB and the PPMs showed low or no cytotoxicity but were able to effectively contain virulence attributes of Candida pathogen. Docking studies revealed that some of the probable compounds have affinity for aspartic acid residue in Sap3 enzyme of C. albicans. Conclusion: Secondary metabolite of strain ADP4 included important classes of therapeutically important compounds. Their anti-Candida activity was mediated by inhibition of critical virulence factors of the pathogen. Keywords: Anti-Candida drug, Virulence factors, Anti-biofilm agents, Phospholipase B, Secreted aspartyl proteinases, Invasive candidiasis. Keywords:Anti-Candida drug, Virulence factors, Anti-biofilm agents, Phospholipase B, Secreted aspartyl proteinases, Invasive candidiasis. Abstract:Background: Despite several advancements in antifungal drug discovery, fungal diseases like Invasive Candidiasis (IC) still remain associated with high rates of morbidity and mortality worldwide. Thus there is an enormous need for anti-Candida drugs.